In one day I received a facebook post from Norway saying that Disappeared had aired Clinton's show there today. I also received a message from Louisiana from a girl that believes Clinton's remains in a certain area. I sent the info the law enforcement but we have had similar info before, not sure if it will lead to anything. Carolyn, thank you for letting us know about this. It must be incredibly difficult with all the starts and stops, dead ends and leads over time. Yet, you stay the course for your son. This may be the tip that's needed to bring Clinton home. Bless you and your family. I hope you get the answers you need. Thank you Muffy! We are not giving up! Acting on a tip, deputies from two parishes are searching part of Red River Parish for a missing person. The search is underway in an area southeast of Coushatta, authorities said. 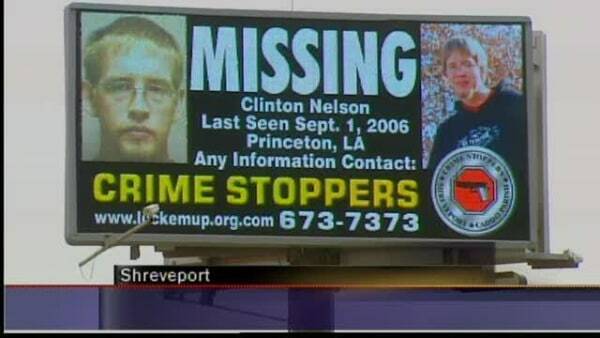 Bossier sheriff's deputies are assisting their Red River Parish counterparts in the search. That is because it could be one of three people missing from Bossier Parish if the tip is accurate, a Bossier Sheriff's Office spokesman said. Arrilla Naomi Webb-Vaul, since March 17, 1979. The search will continue into the night then, if need be, resume around daylight Wednesday, Bossier sheriff's Lt. Bill Davis said. UPDATE: Carolyn said they brought in dog's that hit on this particular area after a tip came in. The dog's detected human remains. Excavator's were brought in to dig, but no remains were found. They did find some fabrics. I hope she comes in to tell you the rest of the story about this particular place...I don't think it's my place to say what she told me happened to Clinton...however, the search continues until the tip can be proven. Thank you Nut44x4 - I appreciate you keeping everyone up to date. There are a number of leads being followed. We have reinstated the $20,000 reward for the location of Clinton's remains and the arrest/conviction of the person(s) responsible. People are talking. Law enforcement is staying busy. It sounds like Dateline will be doing a story and we have gotten a lot of social media coverage. I ask anyone and everyone to share Clinton's poster. You can find the posts on Facebook. Thank you Monkey's! Thank you too, Nut44x4 for keeping us posted! It sounds like we will be getting some press coverage. The Bossier Press will be doing a story on Clinton on August 9 - his 32nd birthday. On September 1, Dateline will be doing a story. That is the 11 year anniversary of Clinton's disappearance. There have been a lot of leads coming in. The search last week, definitely got people talking again. I know that the Bossier Sherriff's office is going to be working on some other local media between Clinton's birthday and the anniversary! Keep praying! As per Carolyn: "8/23/2017 - This is notification that all reward money offered by the family of Clinton Nelson has been withdrawn. The only exception will be if law enforcement indicates that they were working with someone prior to our withdrawl." Nothing has changed. We are still seeking answers. But we are coming up on 11 years and the reward money does not seem to make a difference in bringing forward answers. My son has a child and that money would be better served going into his college fund and helping to meet his needs. I am praying law enforcment will find Clinton and the people responsible. Clinton was born and raised in Spearfish, South Dakota, but had moved down to Bossier Parish, Louisiana in April to get to know his biological father, Jeff, and to take up a new job on an oil rig. Since then, Carolyn has adopted Austin and said, “He’s what helped me keep going, to keep pushing.” She said that he often asks about the father he never met, and why he has never come home. Thank you for posting. Please note, there is one error that was corrected. This says I have adopted Austin. I have not. I have custody and guardianship. I asked Dateline to correct the error. I appreciate all of you monkeys for helping to keep Clinton's story alive and out in the public. This is definitely the most difficult thing any family can go through. Still praying we have answers someday. I'm hoping and praying you will get the answers you need, Carolyn. "Dedicated Facebook Group Helps Solve Grateful Dead Fan’s Disappearance After 20 Years"
I know it is one of those pesky Facebook ads but you never know. It was Sept. 1, 2006, and from 1,300 miles away, Carolyn Johnson could sense something was wrong with her son. Only six months earlier, Clinton Devon Nelson, 21, had moved from his childhood home of Spearfish, South Dakota, where Johnson still lived, to get to know his father in Haughton and work in the oilfield industry. READ more to review details. Page created in 6.213 seconds with 21 queries.